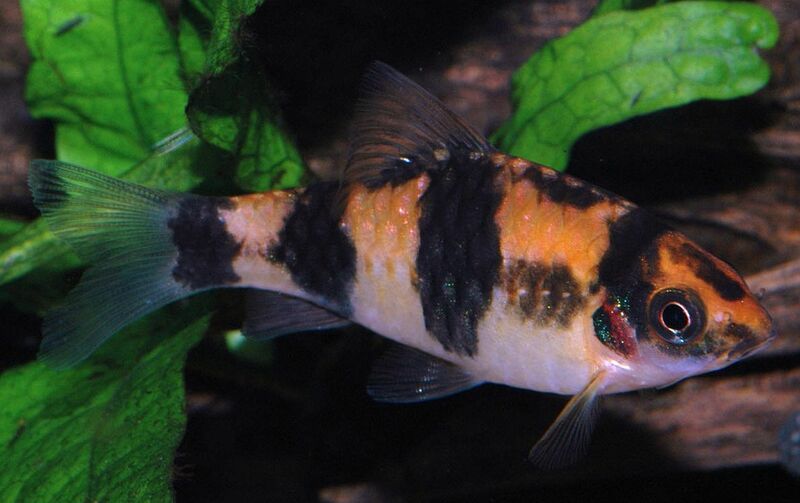 Tag Archive | "Panda Barb (Puntius fasciatus)"
The Panda Barb (Puntius fasciatus) is also known by tropical fish keeping enthusiasts as the Striped Barb, Ember Barb, Banded Barb and Black Spot Barb. The Panda Barb is native to the Western Ghats mountains in the south Indian states of Goa, Karnataka, Kerala and Tamil Nadu. Its range is from the Kanyakumari district at the southern tip of the country, to almost as far as the Maharashtra state to the north. Although it is more common the the western slopes of its range at sea level and in the foothills; it has also been found throughout many river drainage systems. Panda Barbs are found in a variety of environments that include major rivers, hill streams, irrigation canals, ponds, lakes and even ditches. They prefer quiet, shallow areas with lots of submerged vegetation or leaf litter, but they are also found in the fast moving foothill streams. 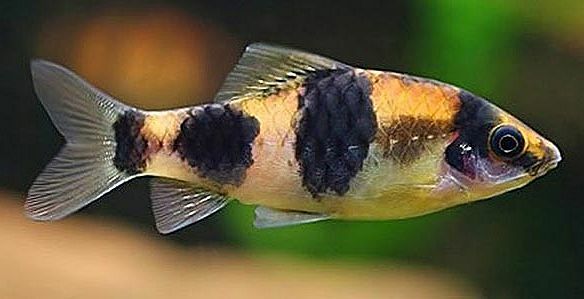 The Panda Barb is a shoaling fish and is usually found in large schools with their own kind and other small cyprinids like the Ticto (Pethia ticto) Barb, Maharaja Barb (Puntius sahyadriensis), Narayan Barb (Puntius setnai), Blackspot Barb (Dawkinsia filamentosua), Mascara Barb (Puntius assimilis), Striped Rasbora (Rasbora daniconius), etc. The Panda Barb is silver with four black stripes running vertically up its body however, a number of geographically isolated varieties differ in color and body patterns. Panda Barbs collected from the headwaters and from mountain streams of highland environments have olive-green, orangy to crimson bodies, instead of silver. Specimens collected from lower altitudes are normally purple or reddish. The number and positioning of the dark body bars is also variable, and dependent on geographical area. Specimens collected from Goa have five bars on their body. Specimens from Karnataka in northern Kerala have four bars, and those from central and southern Kerala, three. Some Panda Barbs collected from southern Kerala only have two barbs on their body and the unique, much desired Panda Barb from Kanyakumari has no bars at all. The Panda Barb is one of the more under appreciated cyprinids. They are hardy, relatively peaceful, colorful, interesting in their behavior and make a welcome addition to any larger community aquarium. 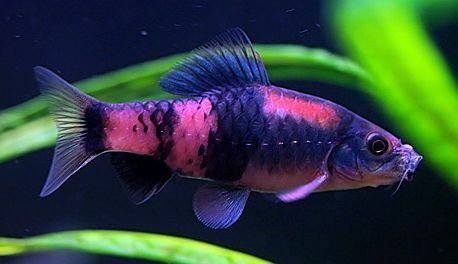 Panda Barbs do best in groups of 8 to 10 or more specimens, and under subdued lighting with a dark substrate to bring out their colors, provide a beautiful aquarium display. They need a large densely planted aquarium with some smooth river rock, pieces of driftwood , twisted bogwood roots, some floating plants and some leaf litter to mimic a gently flowing stream. They require enough filtration to provide some gently water movement in the tank. Panda Barbs are omnivorous and require a variety of foods. In the wild they forage on diatoms, algae, organic detritus, small insects, worms, crustaceans, and other Zooplankton. In an aquarium environment they should be fed a quality flake food augmented with regular offerings of small live, freeze dried, and frozen foods such as bloodworms, daphnia , brine shrimp, small insects, worms, and an occasional algae wafer to enhance their colors and keep them in top condition. , Daphnia or baby brine shrimp . Most tropical fish shops will occasionally stock juvenile Panda Barbs. When available, they are usually sold when they are 1-1/2″ to 2″ in size.